Six doctors who believe government scientist David Kelly was murdered have launched a ground-breaking legal action to demand the inquest into his death is reopened. They are to publish a hard-hitting report which they claim proves the weapons expert did not commit suicide as the Hutton Report decided. They have also engaged lawyers to write to Attorney General Baroness Scotland and the coroner Nicholas Gardiner calling for a full re-examination of the circumstances of his death. The doctors are asking for permission to go to the High Court to reopen the inquest on the grounds that it was improperly suspended. If Baroness Scotland rejects that demand, or the court turns them down, their lawyers say they will have grounds to seek judicial review of the decision. 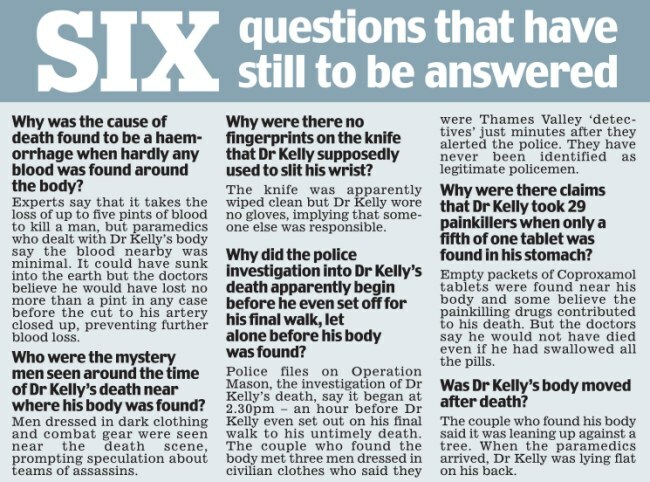 Dr Kelly was found dead at a beauty spot near his Oxfordshire home in 2003, days after he was exposed as the source of a story that Tony Blair's government 'sexed-up' its dossier on Saddam Hussein's weapons of mass destruction to justify invading Iraq. In one final phone conversation, he told a caller he wouldn't be surprised 'if my body was found in the woods'. The inquest into Dr Kelly's death was suspended before it could begin by order of the then Lord Chancellor Lord Falconer. He used the Coroners Act to designate the Hutton Inquiry as 'fulfilling the function of an inquest'. Lord Falconer, a former flatmate of Tony Blair, was also responsible for picking Lord Hutton to run the inquiry. But the doctors claim that the original inquest was never formally closed and should now be allowed to hold a proper inquiry. The six are Michael Powers, a QC and former coroner; trauma surgeon David Halpin; Andrew Rouse, an epidemiologist who established that deaths from cutting the ulnar artery – as claimed in Dr Kelly's case – are extremely rare; Martin Birnstingl, another surgeon; plus Stephen Frost and Chris Burns-Cox. Lord Hutton concluded that Dr Kelly killed himself by severing an ulnar artery in his left wrist after taking an overdose of prescription painkillers but he skated over the controversies about the causes of death. The bulk of his report was dedicated to the political row between Downing Street and the BBC, which revealed the sexing-up of the dossier. Dr Kelly's death certificate states that he died of a haemorrhage, but the results of a post mortem examination have never been made public. Crucially, the doctors say that Lord Hutton had no witnesses on oath and did not have to make a finding, as the coroner does, beyond a reasonable doubt. The doctors tried to persuade the coroner to reopen his inquest in 2004 but were rejected because they were not judged to be 'properly interested persons' with the authority to demand an inquiry. Now they have hired human rights lawyers Leigh Day & Co to challenge the use of the Coroners Act to close the inquest. A source close to the doctors said: 'Lord Falconer is on record saying this is a "useful little law" but it was set up to avoid multiple inquests in cases where there were multiple deaths. It has been used for victims of train crashes and the Harold Shipman case but Dr Kelly's was not a multiple death. 'We argue that that's an abuse of due process. The lawyers have sent the letters this week. A book on the unanswered questions surrounding the case by Liberal Democrat MP Norman Baker concluded that Dr Kelly may have been murdered by Iraqi exiles – but the finger has also been pointed at MI5 and the CIA. Dr Kelly's family have never commented publicly on his death.